China today accused Taiwan for inciting a confrontation and blasted arch-rival for distorting the newly-passed anti-secession law in an attempt to “deceive” the international community on the vexed Taiwan issue. Refusing to budge from its hardline stance towards the Dalai Lama, China today reminded him of its pre-conditions for talks, which included “genuine” renunciation of his quest for “Tibet independence” and a public acknowledgement that the remote Himalayan region was an “inseparable” part of the Communist nation. Most observers believe that neither Pakistan nor India has so far deployed nuclear warheads mated with delivery systems, says the latest congressional report on nuclear threat in South Asia. In an apparent move to cool down a controversy, the government reassured the National Assembly on Monday it would not allow a third party to interrogate Dr Abdul Qadeer Khan about his alleged role in nuclear proliferation and asked the international community to trust Pakistan's own investigation into the matter. 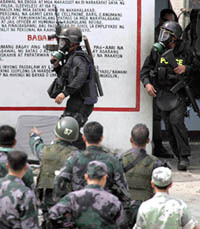 The police killed at least 22 detainees today when they stormed a maximum-security jail, firing tear gas and bullets to retake the facility from Muslim militants who stole weapons from guards during a botched breakout. Three Indian nationals were sentenced to jail yesterday for overstaying in Malaysia, as the country tightened its vigil on illegal workers remaining here long after the expiry of the amnesty period. The mother of an Indian, who is in Qatar jail for the past 11 years, has sought the help of the Embassy in Doha to free her son. Briefing newsmen on the circumstances under which Beijing had to enact the law, Wang Zaixi, a spokesman for the Taiwan Affairs Office of the State Council, China’s Cabinet lashed out at the attempts by the Mainland Affairs Council (MAC) of the Taiwan to distort the anti-secession law. Wang said the MAC aimed to deceive Taiwan compatriots and international opinion by distorting the anti-secession law as a move to change the status quo in the Taiwan Strait and provide “a blank check” for “annexation of Taiwan” by force. “It is a dangerous move for the MAC to try to once again incite confrontation across the Taiwan Strait and create a pretext for “Taiwan independence” secessionist forces to provoke incidents,” he said. The anti-secession law, passed overwhelmingly by the Chinese Parliament yesterday, gives the Chinese People’s Liberation Army (PLA) the legal basis for attacking Taiwan but Beijing insists that such “non-peaceful means” will be used only as a last resort in case the island took steps towards Taiwan independence. Defending the new law, Chinese Premier Wen Jiabao yesterday said the anti-secession law had been made to strengthen and advance ties across the Taiwan Straits, instead of being a war mobilisation order. “We have taken note of his remarks. More importantly we pay attention to his deeds”, Foreign Ministry spokesman Liu Jianchao told reporters here when asked to comment on the Dalai Lama’s latest conciliatory statements in which he vowed not to seek the independence of Tibet from China. “We demand the Dalai Lama to fully and objectively judge the facts and genuinely abandon the advocacy of Tibet independence, give up his various splittist activities, recognise Tibet as an inseparable part of China, Taiwan as an inseparable part of China and recognise the People’s Republic of China as the sole legal government representing the whole of China,” Liu said, restating Beijing’s stance on resumption of talks with the exiled Tibetan spiritual leader. The report by the Congressional Research Service (CRS), which provides policy guidelines to US lawmakers, says that India and Pakistan accelerated nuclear weapons development, and possibly, deployments after testing their devices in May, 1998. Both countries, however, decided to keep the warheads separate from delivery systems to avoid accidents and theft. The report points out that there are two basic nuclear risks in South Asia: nuclear material or weapons falling into the hands of terrorists or a miscalculation leading to a preemptive strike and thus to a nuclear war. The threat of terrorism, the report says, calls primarily for greater physical security at weapons sites and sites where nuclear material is produced or stored, particularly weapons-grade material, such as highly enriched uranium or separated plutonium. The threat of accidental nuclear war calls for safer nuclear weapons, whereas reducing the risk of preemptive or sudden war would require enhancing command and control and possibly transparency between the two states. The Congressional Research Service acknowledges that India and Pakistan have been moving towards more structured nuclear command and control authority, organisation, and strategic planning. But the report warns that it is not clear if India and Pakistan have implemented the two-man rule, which were used by the United States and Russia during the cold war. Under this rule a concurrent involvement of at least two persons is required to fire a weapon. It is also not clear what other procedures have been adopted to prevent unauthorised use, the report adds. Focusing on Pakistan, the CRS points out that some observers believe Islamabad has probably distributed its nuclear weapons in a number of tightly secured facilities at different locations throughout the country. The CRS notes that in Pakistan physical security is provided by the military. India has kept strong civilian oversight of the weapons programme, with the military kept predominantly at arm's length. However, the details of security in both cases are unknown. In April 2000, the Indian Government ended independent safety oversight at the Bhabha Atomic Research Centre, the "nerve centre" of the Indian nuclear weapons programme. Some analysts have interpreted this change as an indication of accelerated nuclear weapons work at BARC, the report says. Information and Broadcasting Minister Sheikh Rashid Ahmed also told the lower house the government had no responsibility if Dr Khan, father of Pakistan's nuclear bomb and now in virtual detention, had transferred any 'antiquated' nuclear material to any foreign country. The minister was speaking while opposing two identical opposition adjournment motions seeking a debate on his statement last Thursday when he said Dr Khan had transferred nuclear centrifuges to Iran on his own. His statement to reporters sparked a controversy in the National Assembly and outside about its credibility and motives, with opposition parties accusing him of endangering national security. Monday's discussion came a day after international media reports quoted unidentified diplomats in Vienna as saying that Pakistan would soon hand over components of used centrifuges to the International Atomic Energy Agency (IAEA). Interior Secretary Angelo Reyes said four leaders of the Al-Qaida-linked Abu Sayyaf group were among the dead, including two men who headed yesterday’s escape attempt at Camp Bagong Diwa in Manila that left an additional five persons dead. “The terrorists got what was coming to them,” Ignacio Bunye, press secretary for President Gloria Macapagal Arroyo, said in a statement. Of the three Indian nationals, one was sentenced to eight months’ jail while the other two were given six months each, the New Straits Times has said. A total of 87 Indonesians, Indians, Bangladeshis, Thais and Chinese nationals were convicted and sentenced yesterday on charges of illegal entry and using expired work permits or forged documents. The sentences were handed down by various courts in Kuala Lumpur, Ipoh and Klang cities. According to reports, vegetable and fruit prices had shot up in the absence of plantation workers. The government’s tough stand against illegal immigrants has caused 56 Indian restaurants to close shop in various parts of the country, Malaysia Nanban has reported. The Indian Embassy has received a letter this week from Nafesa, mother of Abdul Rahman Madassery, hailing from Kerala, seeking its assistance for the release of her son. The Embassy is looking into the possibility of securing an early release for Rahman.